The wola is over, Etisalat Nigeria is now officially 9Mobile Nigeria with new logo, new branding and also cheap call plan and tariff offers. 9Mobile is promoting the "9ja for life" brand with the cheapest 9Mobile call tariff for local and international calls as well as free night calls. We present a list of all the 9Mobile call tariff plan and migration codes to enable you enjoy the cheap calls on 9Mobile network. See how to migrate to some of the best 9Mobile Prepaid Plans and enjoy cheap 9Mobile call rates in Nigeria. Enjoy calls at 11 kobo per second (11kobo/s) to all local networks from the very first second after a one time N5 daily access fee. Dial *420*1# to migrate to 9Mobile More Life tariff plan. Check how many minutes you can call with N100 on 9Mobile MoreLife call plan? Calls made on this tariff plan to all 9Mobile line will be charged at 20k/sec, Cliq to Cliq call rate is 15k/sec and calls to all other networks will be charged at 40k/sec. You will also get free midnight calls from 12:30 am to 4:30 am BUT you must have used up to ?25 daily. 9Mobile’s EasyStarter unique family & friends feature (You & Me) gives you N300 a week to call five special numbers when you recharge N200. you also get N100 if you recharge N100 a week. It helps you stay in touch with all your loved ones. EasyStarter normal tariff reduces by half, from 40k/sec to 20k/sec to all networks if you use up to N25 naira a day. How many minutes will I get with N100 airtime on EasyStarter call plan? Therefore with N100 recharge card, you will get > N176/N12 + ( bonus extra 60 secs) = 15 minutes 26 seconds. It is also one of the simplest and best bonus plans on 9Mobile. When you recharge N300 Naira, you will be given free 50MB and N900 Naira to call all networks in Nigeria with data. Higher recharge gives you equally higher bonus. 300% bonus on flex 300, 500 and 1000 bundles. 150% bonus on flex 2000 and 5000 bundles. 300% bonus on flex 4000, 10,000 and 20,000 Bundles. Buy 2000 and 5000 flex bundle twice consecutively, you will get the third Bundle for free. Recharge 5,000 and above, you will get free incoming calls while roaming on selected networks in 6 countries. UK (vodafome), US (T-mobile), South Africa (vodacom), UAE (etisalat), Netherlands (KPN) and Saudi Arabia (mobily). Th9Mobile MoreFlex Bundle is valid for a month ( 30days ). After successful recharging, dial the activation code in the Bundle Plan list to activate e.g *344*500# for N500 naira MoreFlex Bundle. Then you will be given your data and credit to call all networks. Talkzone gives you discounts on your call rates depending on where you are when you call. This 9Mobile tariff plan is quite similar to the MTN Zone prepaid plan. You can get as low as 80% discount on calls made to 9Mobile lines ie 12k/sec at off-peak time (12:30am to 4:30am). 100% bonus on data plans from 50MB to 500MB. 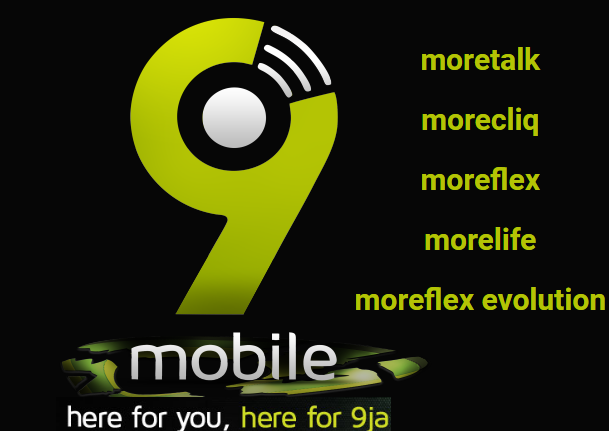 More details about 9Mobile (Etisalat) Breakfree offer. Then dial *545# to choose from the packages. 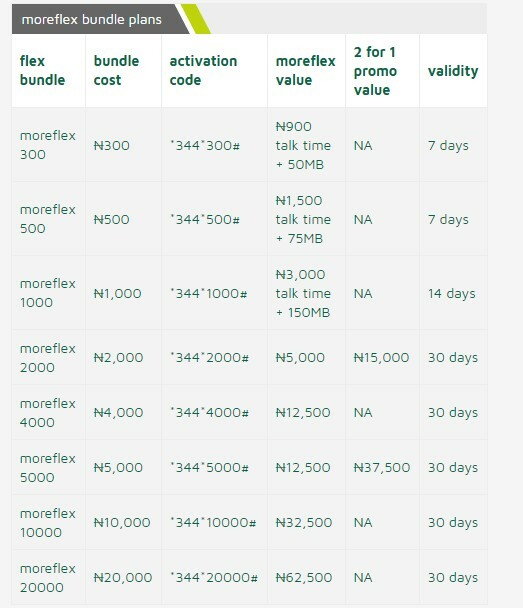 9Mobile MoreFlex Evolution offers a special Voice and Data bundle package depending on which bundle you prefer. 2. Data + for heavy data users. Dial *320# to select between Voice plan or Data Plus plan. 9Mobile is continuing the Etisalat Nigeria “CLIQLITE” mobile prepaid package which provides zero access rate for educational and entertainment apps. The service is targeted at children between the ages of 8 – 15 years old. Everyone can enjoy Etisalat Cliqlite, even though it’s designed to support learning and development for children and teenagers. This plan gives a one time bonus offer when you buy a new sim. It gives you an instant bonus of N1400 for calls on your first time recharge of N200 on your new 9Mobile line. The new 9Mobile Nigeria (previously Etisalat Nigeria) promises even more affordable calls and data plan. This is just the icing, we will keep you up to date on new plans.